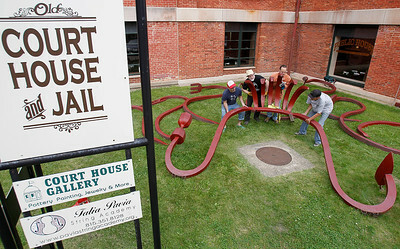 Matthew Apgar - mapgar@shawmedia.com Artist Bobby Joe Scribner of Woodstock, left, has help from Nathan Friedel, both of Woodstock, as they lay out the pieces to a large metal sculpture titled "hairdo" outside of the Old Court House Art Center on Thursday, June 11, 2015 in Woodstock. 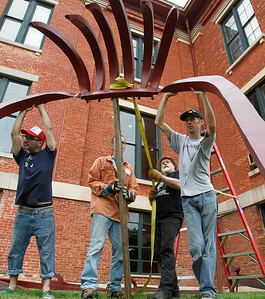 Matthew Apgar - mapgar@shawmedia.com From left: Gabriel Karagianis, Greg Gantner, Bobby Joe Scribner, and Nathan Friedel lift up the front of a large metal sculpture titled "hairdo" outside of the Old Court House Art Center on Thursday, June 11, 2015 in Woodstock. 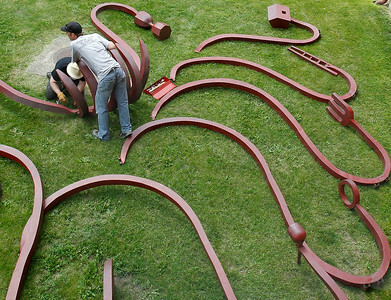 The Scribner sculpture is on display in the lawn of the art center for the Summer Solstice Art Exhibition, for which Gantner and Karagianis are co-curators. 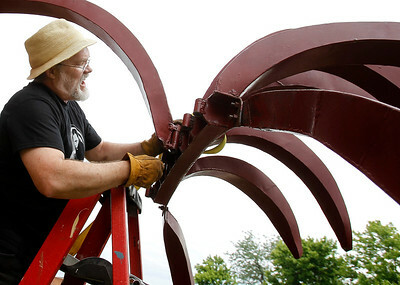 Matthew Apgar - mapgar@shawmedia.com Sculpture artist Bobby Joe Scribner of Woodstock works on installing a large metal piece titled "hairdo" outside of the Old Court House Art Center on Thursday, June 11, 2015 in Woodstock. 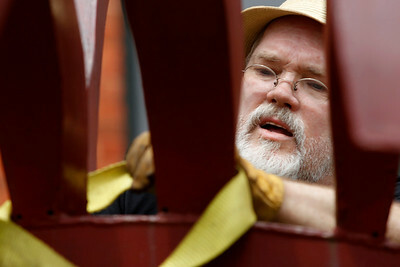 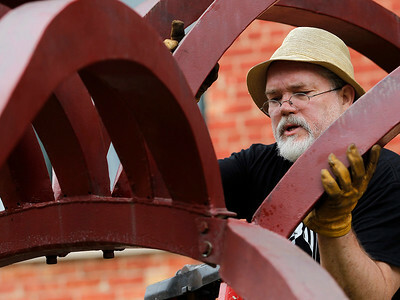 Sculpture artist Bobby Joe Scribner of Woodstock works on installing a large metal piece titled "hairdo" outside of the Old Court House Art Center on Thursday, June 11, 2015 in Woodstock.